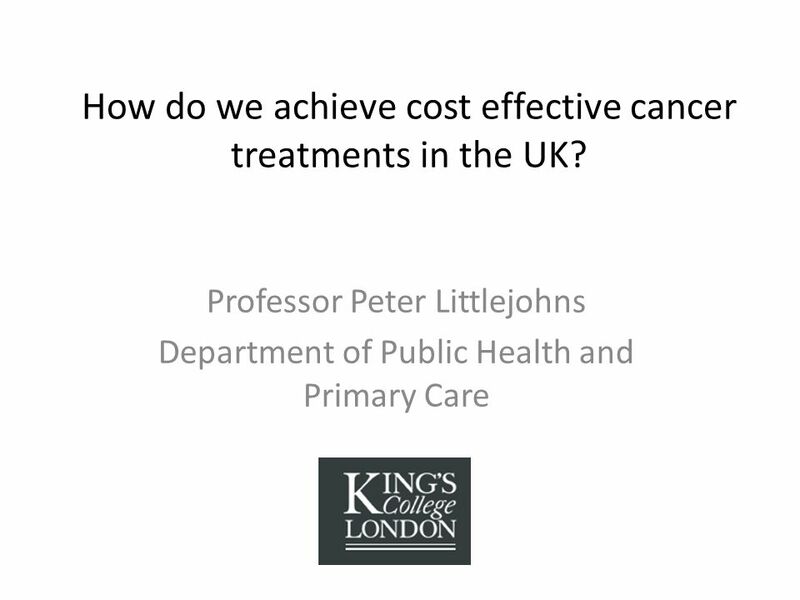 How do we achieve cost effective cancer treatments in the UK? Professor Peter Littlejohns Department of Public Health and Primary Care. 13 Process Values: Participation Who might participate? 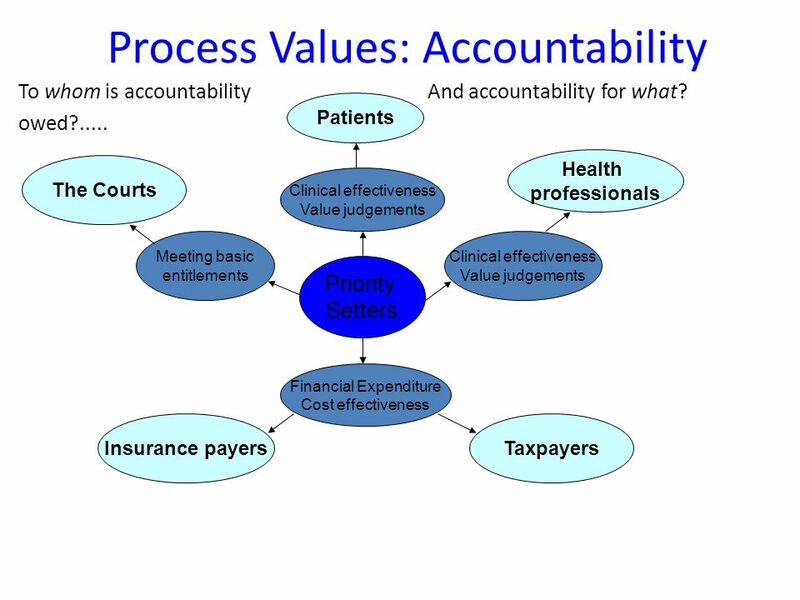 Patients, health professionals, experts, taxpayers, insurance payers, citizens…. 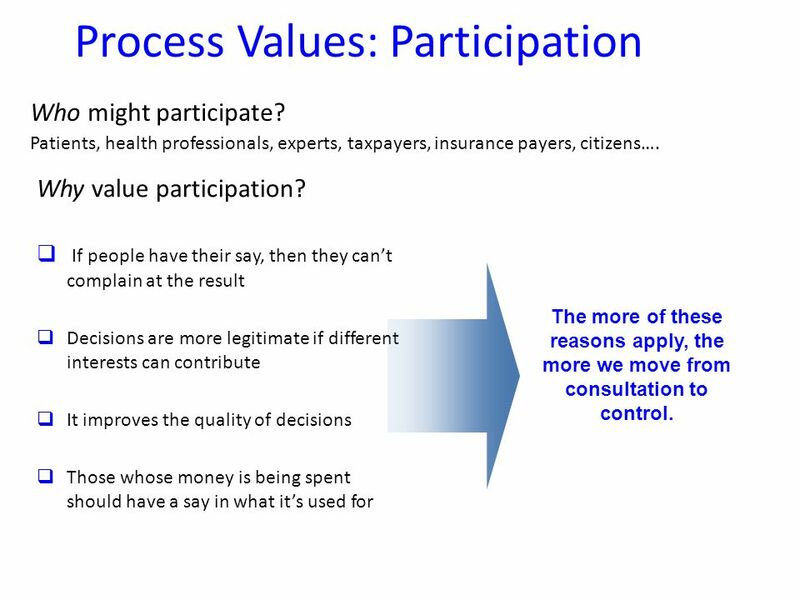 Why value participation?  If people have their say, then they can’t complain at the result  Decisions are more legitimate if different interests can contribute  It improves the quality of decisions  Those whose money is being spent should have a say in what it’s used for The more of these reasons apply, the more we move from consultation to control. 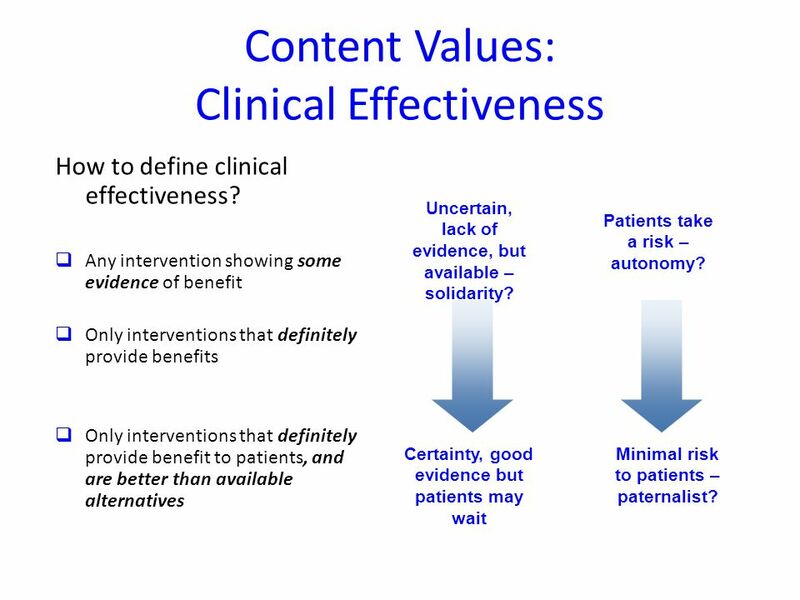 14 Content Values: Clinical Effectiveness How to define clinical effectiveness? 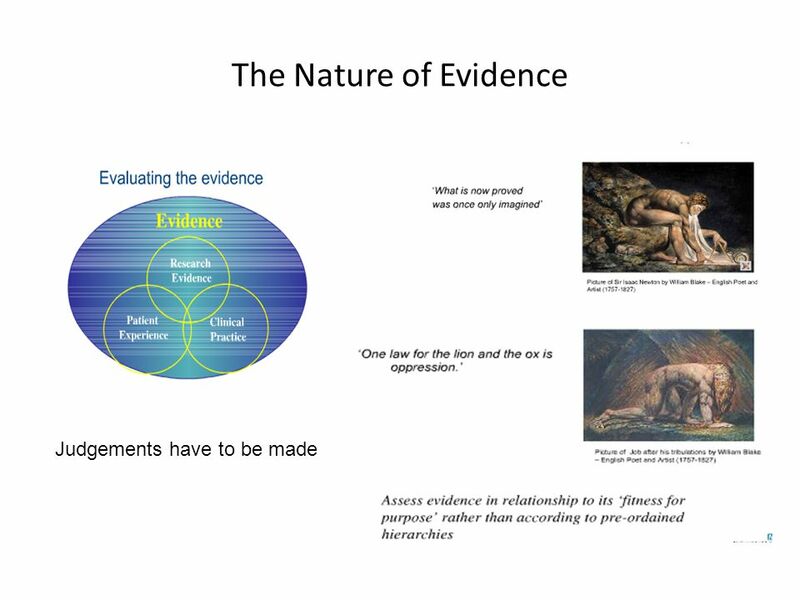  Any intervention showing some evidence of benefit  Only interventions that definitely provide benefits  Only interventions that definitely provide benefit to patients, and are better than available alternatives Uncertain, lack of evidence, but available – solidarity? Certainty, good evidence but patients may wait Patients take a risk – autonomy? Minimal risk to patients – paternalist? 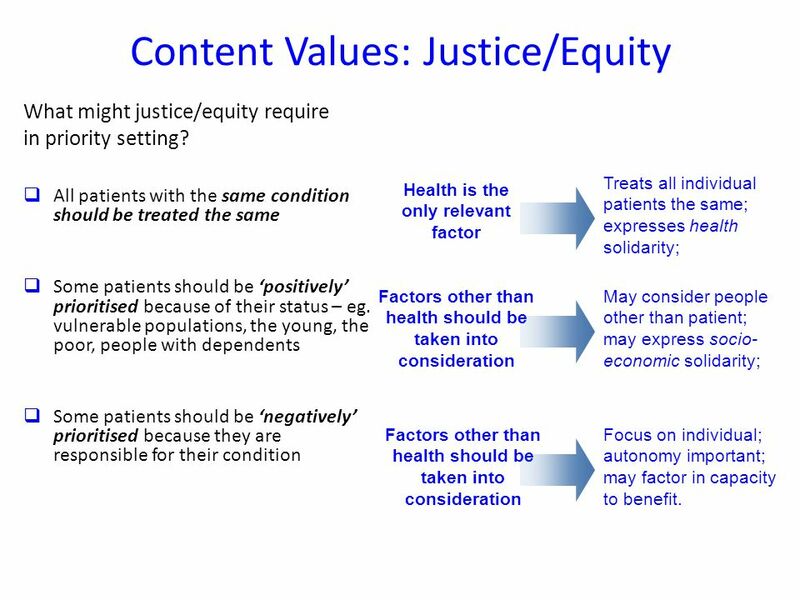 16 Content Values: Justice/Equity What might justice/equity require in priority setting? 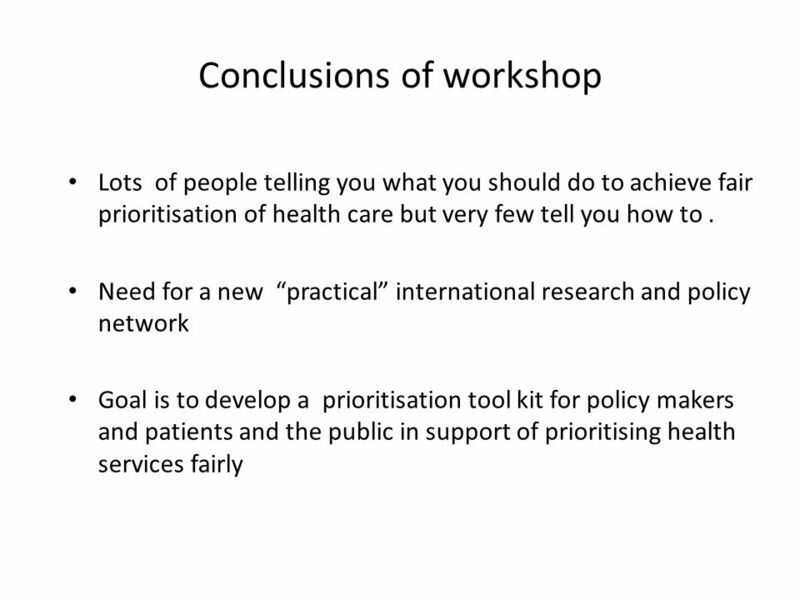  All patients with the same condition should be treated the same  Some patients should be ‘positively’ prioritised because of their status – eg. vulnerable populations, the young, the poor, people with dependents  Some patients should be ‘negatively’ prioritised because they are responsible for their condition Health is the only relevant factor Factors other than health should be taken into consideration Treats all individual patients the same; expresses health solidarity; May consider people other than patient; may express socio- economic solidarity; Focus on individual; autonomy important; may factor in capacity to benefit. 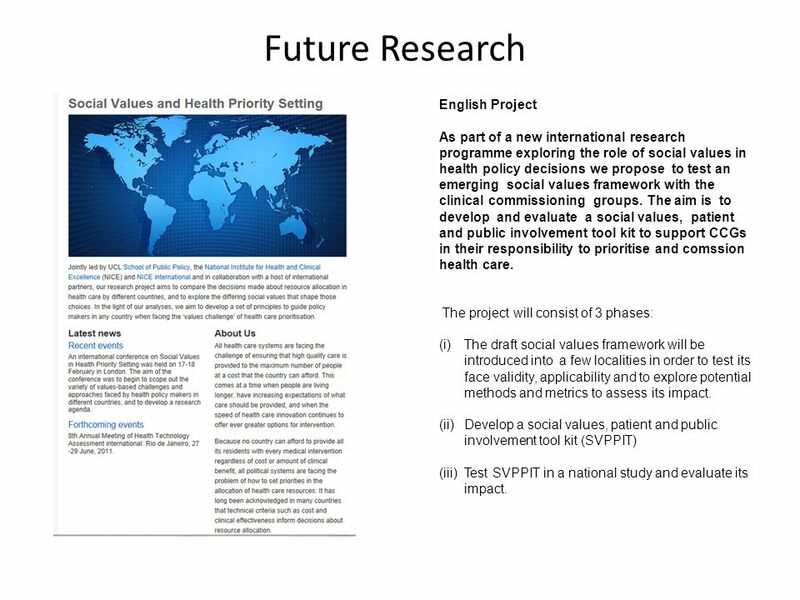 20 Future Research English Project As part of a new international research programme exploring the role of social values in health policy decisions we propose to test an emerging social values framework with the clinical commissioning groups. 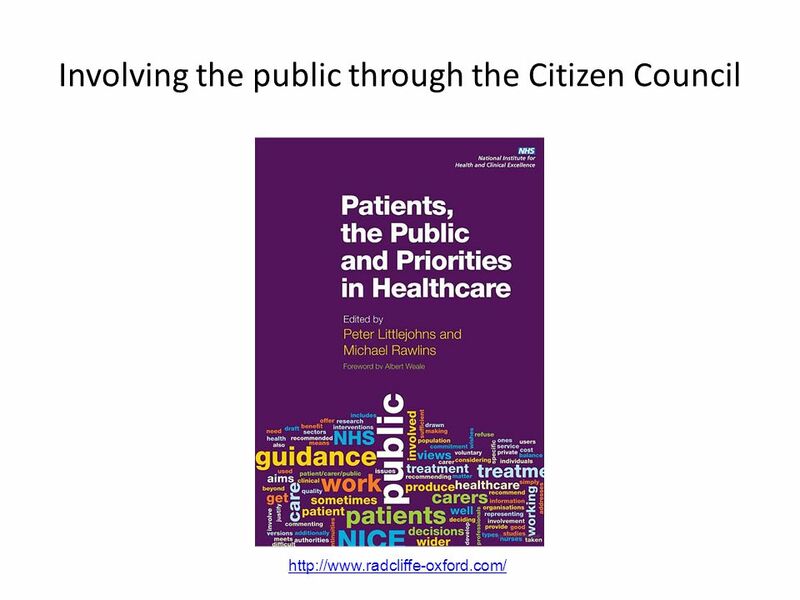 The aim is to develop and evaluate a social values, patient and public involvement tool kit to support CCGs in their responsibility to prioritise and comssion health care. 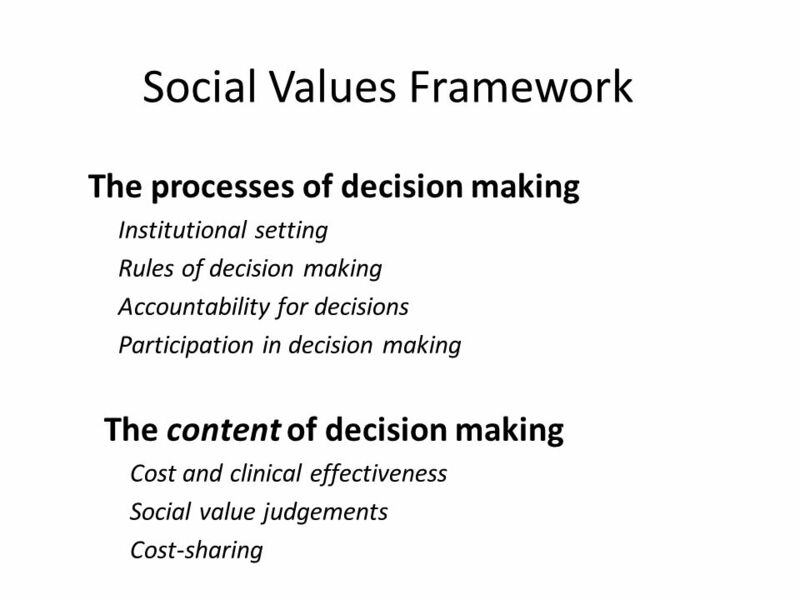 The project will consist of 3 phases: (i)The draft social values framework will be introduced into a few localities in order to test its face validity, applicability and to explore potential methods and metrics to assess its impact. 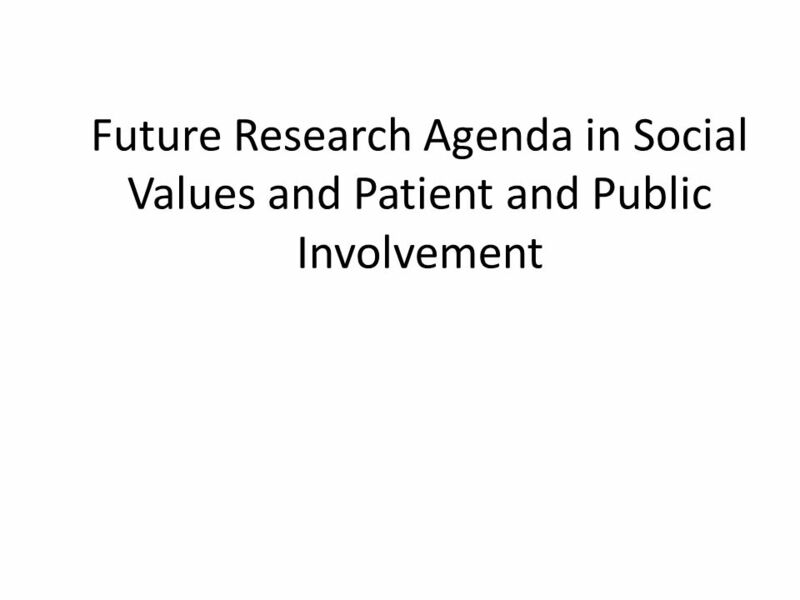 (ii)Develop a social values, patient and public involvement tool kit (SVPPIT) (iii)Test SVPPIT in a national study and evaluate its impact. 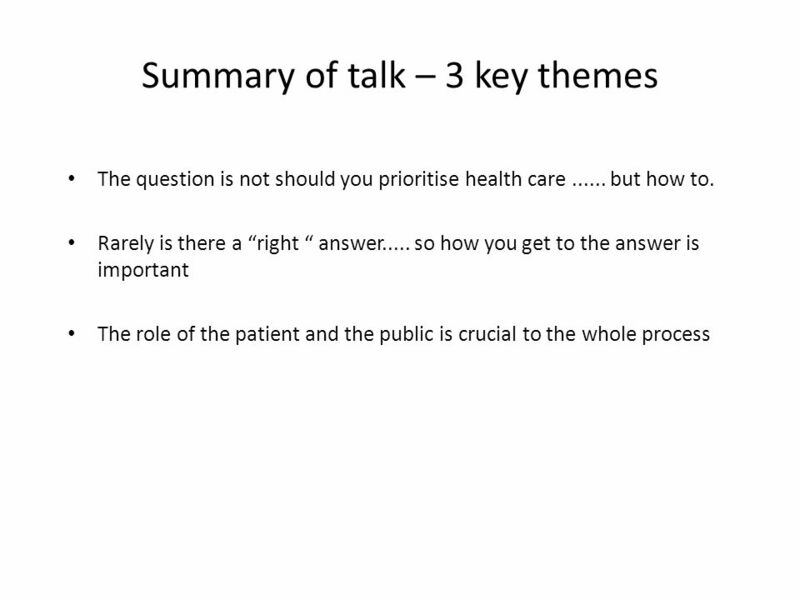 Download ppt "How do we achieve cost effective cancer treatments in the UK? 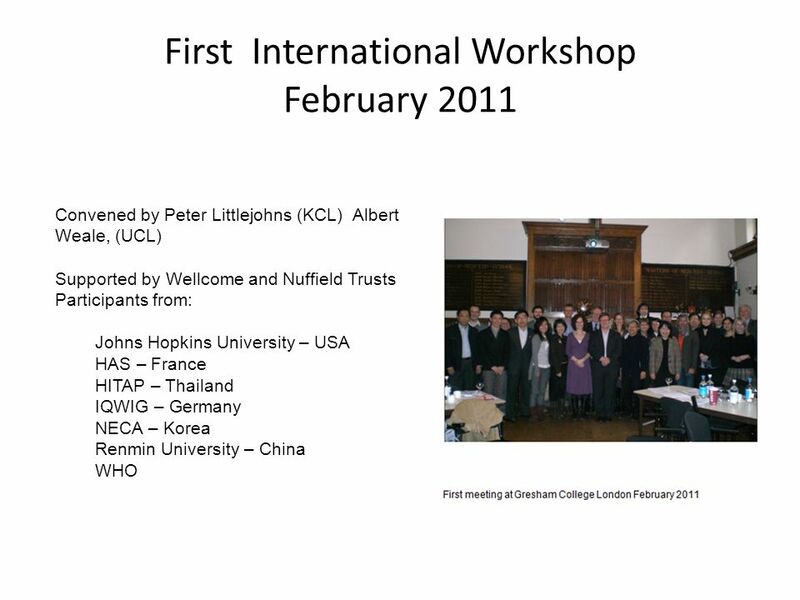 Professor Peter Littlejohns Department of Public Health and Primary Care." 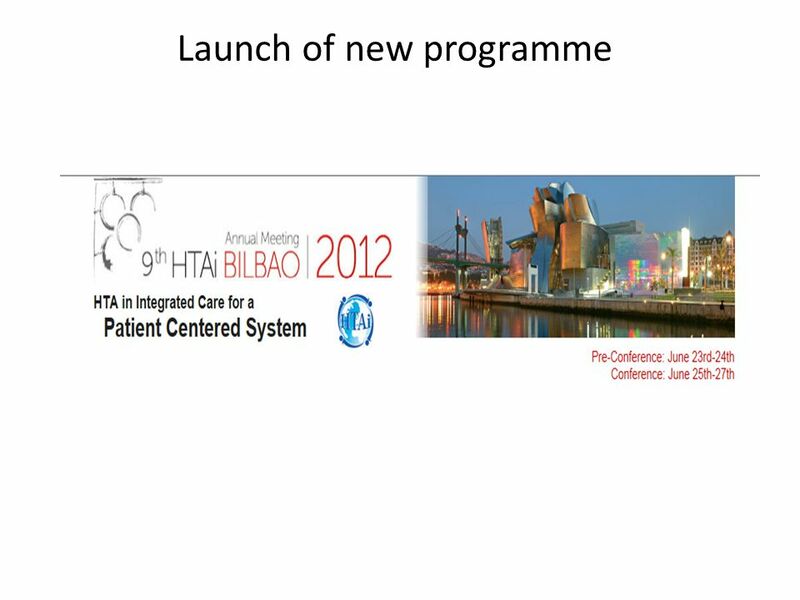 National Treatment Agency September 2009 Needs Assessment and the balanced treatment system 25 October 2010 London. 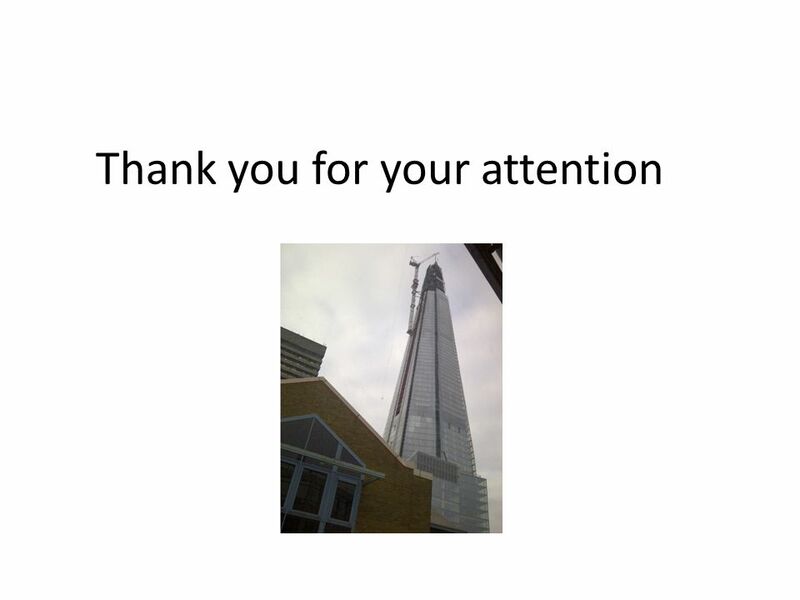 Modernising Scientific Careers NHS East Midlands – Early Adopter Workshop Commissioning MSC Programmes. No. 1 Organizing Eldercare The Danish Case in a Comparative Perspective Morten Balle Hansen, Professor, PhD Department of Political Science, Aalborg University. Presentation by Cambodian Participants Phuket, Thailand February 2012 Health Impact Assessment Royal Government of Cambodia. 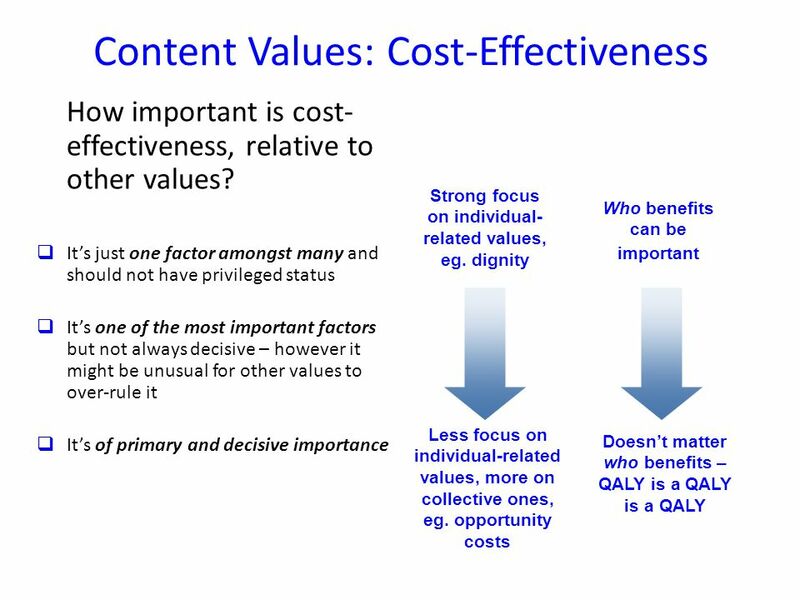 Making Decisions in Health Care: Cost-effectiveness and the Value of Evidence Karl Claxton Centre for Health Economics, Department of Economics and Related. Herefordshire Public Services Consultation on local priorities Improving the way we fund and prioritise services. 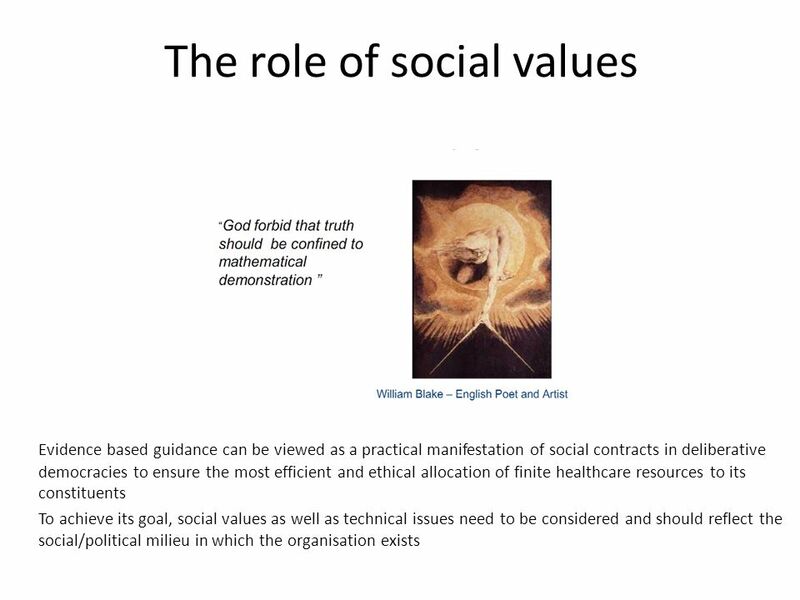 BALANCING EFFICIENCY AND EQUITY A NEW INTERNATIONAL RESEARCH PROGRAMME ADDRESSING THE ROLE OF VALUES IN HEALTH CARE Department of Primary Care and Public. Creating Better Health and Care Services An overview of a Better Health and Care Review process. Subject Selection and Recruitment David Wendler Department of Clinical Bioethics NIH, USA. 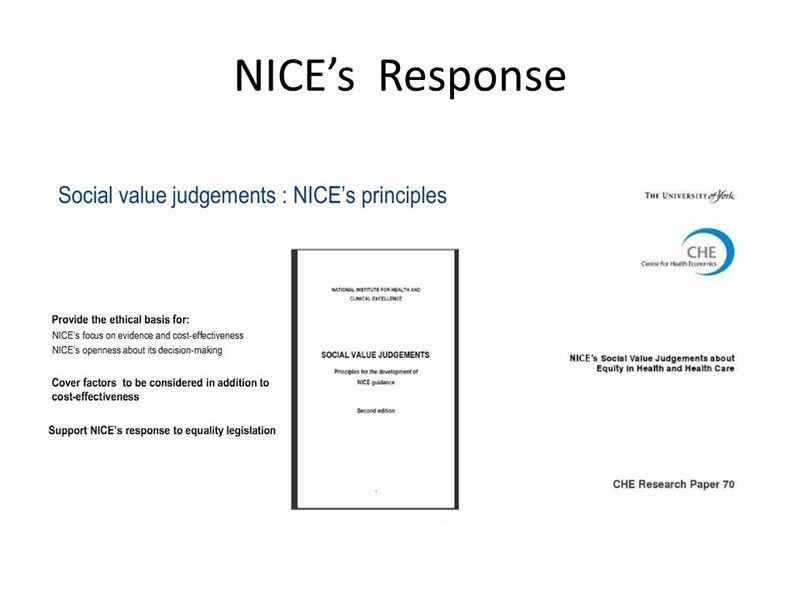 Departing from the health maximisation approach Social value judgements made by NICE’s advisory committees Koonal K. Shah Office of Health Economics, UK. Risk Management and Strategy Prioritisation Intelligence Step 8 - Risk Management and Strategy Prioritisaiton Considering the risks associated with action. NICE in a changing world North East Leading Improvement for Health and Well- being programme Professor Mike Kelly Director, Centre for Public Health Excellence. A tisket, a tasket, is MNCH in your benefits basket? March 2, 2015. 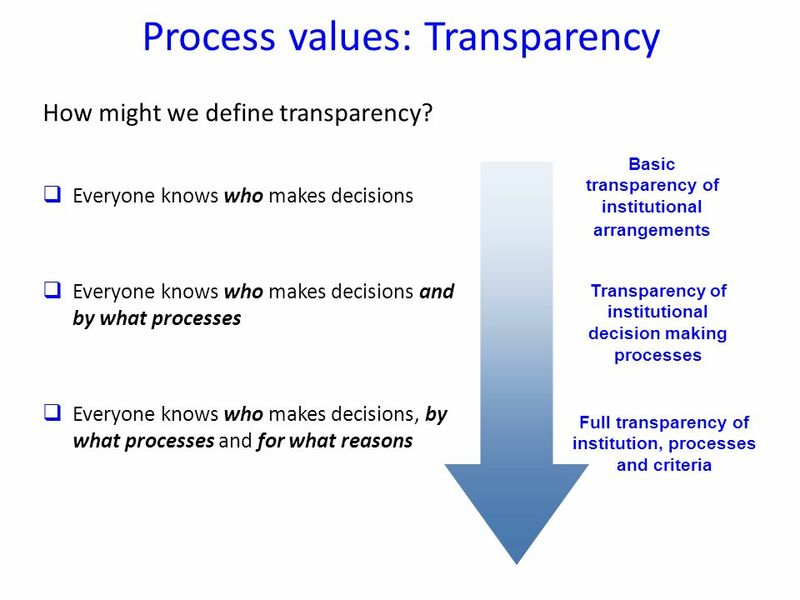 An Imperfect Model for Democratic Decision Making Gemma Stacey, Philip Houghton & James Shutt Representing Critical Values Based Practice Network www.criticalvaluesbasedpracticenetwork.co.uk.